When travelers consider Guatemala, the first thing that might come to mind is an adventure travel destination. Images of zip lines, jungles, and beautiful ruins might play in the traveler’s consciousness. But instead, I’m here to offer another view of the country: its gastronomy. While exploring the Guatemalan highlands, I was introduced to the incredible culinary traditions that tend to combine Maya and Spanish influences creating something unique to Guatemala. Featured here are some of the fantastic foods I enjoyed in the highlands and Guatemala City, along with the places where you too can experience them and meet people who crafted them. From the traditions of the Maya culture to fine dining and haute cuisine, Guatemala is truly a culinary destination to please foodies and explorers alike. 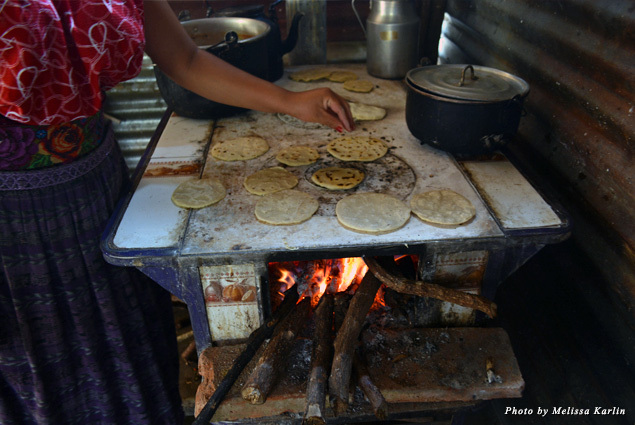 The staples that make up most of Guatemalan cooking are corn, beans, plantains, chicken, rice, and many fresh and delicious fruits and vegetables. Corn in particular is incredibly important to the Maya peoples. Their holy book describes mankind as made from corn, and it is a tent pole in their gastronomic traditions. From handmade tortillas to tamalitos (small tamales) to thickening caldos or stews with wet masa paste, corn is everywhere in Guatemala. But this isn’t the sweet corn we often enjoy in the states. 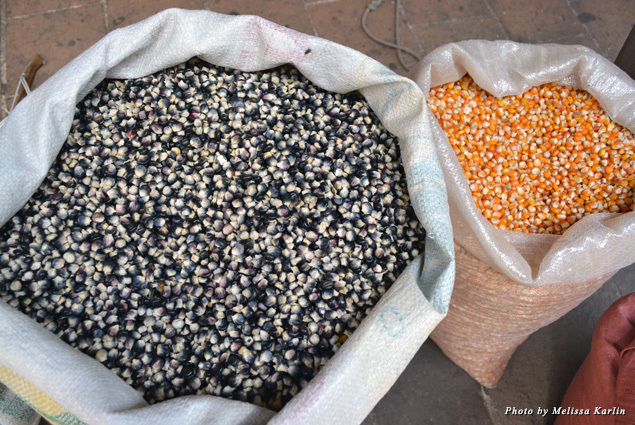 The corn in Guatemala is starchier and comes in a variety of colors: red, black, white, and yellow. Wandering through a Guatemalan market, whether in Chichicastengo or Antigua, you will find these varieties piled up in bags or as wet masa pasta slapped together to make thick tortillas on a wood-burning comal (a griddle). All senses are entranced in any Maya market—sights, smells, sounds, even the air has a kind of texture from the crowds, produce, and cooking on site. Caldos are common dishes to be served in Guatemala. There are casual and everyday versions, such as caldo de pollo (chicken soup), and then there are more complex iterations, including pepian, a stew made from roasted and crushed vegetables and chilies, boiled meat, and ground pepitas (pumpkin seeds). Both dishes I had the opportunity to make with a local family, which made this trip to Guatemala an immersive experience into the Maya culture. You can book an experience like this by contacting INGUAT, a Guatemalan tourism board. Fresh fruits and vegetables are everywhere in the highlands of Guatemala, from roadside fruit stands to beautiful elote sold at the edge of Lake Atitlan to avocados sold from a kind of corner shop with snacks and cigarettes. Really, one of the most amazing parts of visiting the highlands was the freshness of everything. And this didn’t just apply to the produce; I also had a couple experiences where this freshness applied to the meat as well. At Paseo Xejasmin, a farm and restaurant between Guatemala City and Chichicastengo, the meat served comes from pigs slaughtered on site. It’s a little sad to think about—poor pigs—but while enjoying a breakfast at the establishment, I tried some of the chorizo and ham made there. It was mind-blowing good. The smokiness of the chorizo was unlike anything I had ever experienced; it was clean and bright in flavor and texture. The rest of the breakfast was incredible as well—a full plate filled with eggs, beans, plantains, pancakes, and opening with a thin oatmeal common in Guatemala households. Another fantastic aspect of this restaurant is the tortillas are made right in front of you on a wood-burning comal. If you ask, the woman making them might let you help and teach you how to hand-press them. While learning how to make caldo de pollo with a family in San Juan La Laguna, a Maya village on Lake Atitlan, I had my first foray into tortilla making. Slapping my hands together with sticky masa and water was completely hilarious, because I was terrible at it, and amazing, because I was making tortillas. They kept coming out lopsided and our hosts would laugh at our silly American group, probably wondering why we sucked so much at making circles. I even took this experience home and attempted to do it in Los Angeles. It half worked; they still came out sort of lopsided. This stew was also made from a chicken slaughtered just for us from the family coop. It was the freshest meat I had ever had, until of course the breakfast at Paseo Xejasmin. To experience a more contemporary take on traditional food, Los Tres Tiempos in Antigua offers a fresh and modern approach to traditional flavors. The meal was of course served with tortillas, and the grilled meats were flawless. The guacamole was particularly creamy, and I’m pretty sure it was just avocado and limon. I also partook in a tamarind margarita, which was incredibly refreshing. For those more in the mood for a restaurant with a magnificent view, there’s El Tenedor del Cerro in the hills above of Antigua. This fusion restaurant features a global menu, oftentimes with a small Guatemalan twist. It’s nestled at the edge of an arts and culture park, so walking through the site on your way to the restaurant you will encounter many outdoor sculptures and murals. 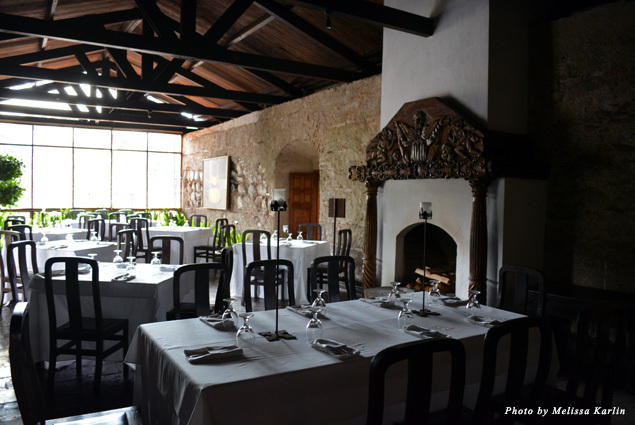 This restaurant is part of the Hotel Casa Santo Domingo, the main site of which is located in the center of the colonial town. This main location is housed inside the ruins of a former convent, which creates an amazing historical and mystical atmosphere. At the hotel’s El Refectorio del Prior restaurant, diners will experience a fine dining fusion of European and Guatemalan techniques and flavors in a truly spectacular space. 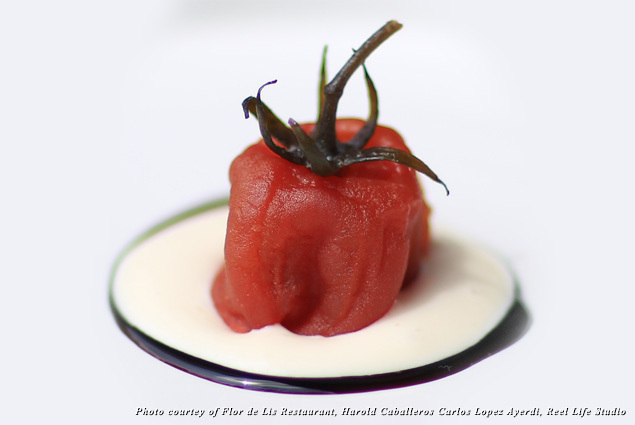 And taking the traditional and European fusion to a whole different planet is one restaurant in Guatemala City: Flor de Lis in the Paseo Cayala. Chef Diego Telles uses the contemporary techniques he learned while working the kitchens of two of the world’s top restaurants—Mugaritz in Spain and Noma in Denmark—to create something completely new. He and his team work to reinterpret traditional flavors by presenting them in new ways. The most striking example of this was offered in a tomato. The sweet tomato dish was first nixtamalized in calcium oxide for one day and then boiled in syrup for seven hours before being left in the fridge for up to a month. 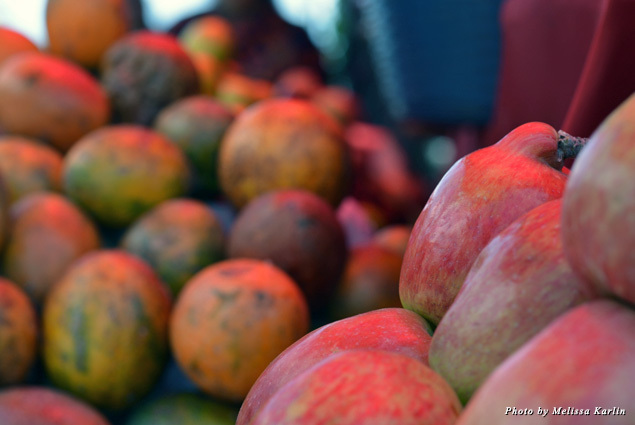 This process gave the fruit a kind of candy-like texture similar to what one could experience in the traditional Maya candies found in Antigua. And of course this meal wouldn’t be Guatemalan without a little bit of corn, and the sweet corn croquettes we began the meal with were heavenly. They were made with chile cobanero, topped with just the right amount of salt, and smoked in mirra. As an added bonus, the dish was served in a kind of pot with a face and smoke oozing slowly out; when opened it revealed the little golden nuggets of happiness. This restaurant is truly foodie heaven, bringing creativity and experimentation to a kind of food that has been rooted in several hundred of years of traditions. Some of those traditions include two of the great exports of Guatemala: coffee and chocolate. Antigua is the perfect town to experience both up close and personal. At the Centro Cultural La Azotea, one can learn about the history of coffee and the history of the plantation site on which the museum is based. Most excitingly, this family-run site is a working coffee plantation. One can taste the coffees grown and roasted on site after a tour. The coffee from Antigua tends to have a more potent sense of acidity due to the elevation and this coffee is no different, but instead of biting the tongue as a poorly roasted acidic coffee might, I found the flavors quite robust and balanced. At this shop you can also purchase the coffee and chocolate from the region as well. But for true chocolate lovers, a visit to the Choco Museo is a must. 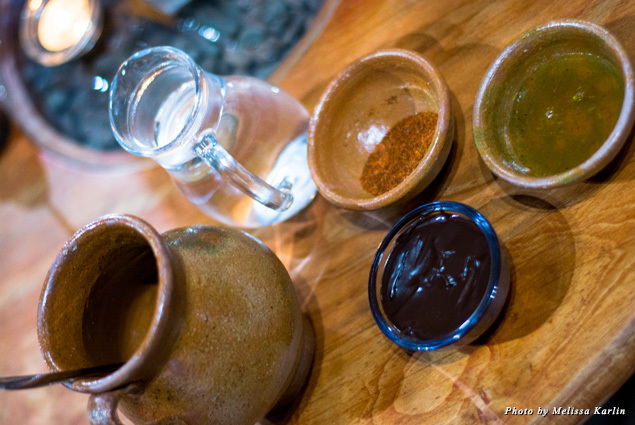 There you can partake in a traditional Maya hot chocolate demonstration. It was really a lot of fun. The Maya hot chocolate is made from chocolate disks, which are dark and melted down when whisked with hot water or milk. You can purchase some of the chocolate disks to bring home, however, you can also buy the same hot chocolate disks from a traditional artisanal chocolatier in San Juan Del Obispo. This factory is not only a cheaper place from which to purchase the actual chocolate, but it also allows for visitors to see the people who make the chocolate and support a local business. The gastronomy of Guatemala is completely underrated, and exploring these traditions both old and new opened my eyes to a whole new world of eating. It was a truly a delicious journey from beginning to end.